16th of July 2011, Day 62 of our Cross Canada (and back) Trip. As we woke up at Peter and Maia's place the smell lingering into our bedroom from the kitchen was simply irresistible. A breakfast for royalties.... Baked apple pancakes with maple syrup, orange juice and freshly brewed coffee... Wow! So good. 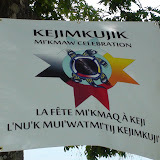 The plan for the day was to back track a bit and go to Kejimkujik National Park and Historic Site of Canada. This park is different from the Kejimkujik Seaside National Park. See our previous blog. After about an hours drive we arrived at Kejimkujik. The in-land park is 381 square kilometers compared to the 22 square kilometers Seaside park. The parks are both equally impressive in their own way. See our website for all 42 National Parks of Canada. The inland park is old Mi'kmaq territory. It has a lot of history dating back thousands of years. There are even some petroglyphs in the park. These areas are restricted, and can only be viewed with a Mi'kmaq guide. We were lucky enough to be able to have a quick look at these. Kejimkujik National Park lies right in the centre of the old traditional canoe and portage routes between the Bay of Fundy and the Atlantic Coast. The earliest known inhabitants of Kejimkujik National Park were the Maritime Archaic Indians. They were here from about 4,500 years ago. The Woodland Indians, a nomadic tribe, were next to inhabit the Kejimkujik. They had seasonal campsites along rivers and the lake shores, which they used during fishing and hunting excursions. The Mi'kmaq people are descendants of the Woodland Indians. They have called this area home for the last 2,000 years or so. The petroglyphs in the park are one remaining trace of the Mi'kmaq peoples life in the Park, very interesting. The park is great for hiking, biking, canoeing, camping and more. There are places where you can rent canoes etc. When we were at Kejimkujik there was a big celebration going on: "The Centenial Celebration" (Parks Canada being 100 years old), and also to celebrate the release of 100 Blanding Turtles. The park is home to 3 species of turtles, The Blanding Turtle, The Easter Painted Turtle and The Snapping Turtle. Wildlife is plentiful in the park. We were fortunate to be able to go with a guide and see some of the petroglyphs. Very interesting and informative. We of course had to go for a hike along one of the rivers. A river really is full of life and energy. Very soothing for the soul. After the park, our next stop was Mahone Bay. The picturesqueness of this small historic town can not be described in words (but we will try) and should really be experienced. Mahone Bay dates back to 1754. It was first settled by people from Lunenburg of German, Swiss and Montbéliardais (some small Kingdom in France) decedents. The main focus here was to get some Protestant religion into a mainly Catholic area. The bay is well protected and offers great boating amongst the 365 islands in the area. Mahone Bay is a pro-active little community, a lot of artists call this area home. Further it is home to some of the most photographed churches in the world. We stopped here for supper at a wonderful restaurant called "The inlet cafe". The inlet cafe is great: amazing food, great service, and a wonderful setting. The place to eat in Mahone Bay. Meanwhile back in Tantallon Peter and Maia were busy with a film crew shooting a TV show in their house. Once we got the call that the coast was clear to come back and all the filming was done, we headed back. Flamed bananas in brown sugar, butter and rum was served as we walked in.... Life is good (two more hikes needed to work this off)! Next day, Day 63 of our trip, the 17th of July 2011, we spent the morning doing a bit of business, banking, email etc. Later we hopped in the truck and headed for Peggys Cove also known as Peggy's Cove. The first recorded name of the cove was Eastern Point Harbour or Peggs Harbour in 1766. The village may have been named after the wife of an early settler or taken its name from St. Margaret's Bay as it marks the eastern beginning of the Bay and Peggy is a nickname for Margaret. Two versions of the popular legend claim that the name came from the sole survivor of a shipwreck at Halibut Rock near the cove. Artist and resident William deGarthe said she was a young woman while others claim she was a little girl too young to remember her name and the family who adopted her called her Peggy. In both versions, the young shipwreck survivor married a resident of the cove and became known as "Peggy of the Cove" attracting visitors from around the bay who eventually named the village, Peggy's Cove, after her nickname. We made a visit to Peggys Point Lighthouse which marks the entrance to Margaret's Bay. The rocks are just wonderful to jump around on, but it can be dangerous. Every year, someone will fall or get swiped in to the ocean. Be careful please. Most of you probably remember the tragic event of Swiss Air Flight 111. On the 2nd of September 1998 Flight 111 crashed in the Atlantic ocean just 8 km off the coast of Peggys Cove, with no survivors. A memorial is now on the shores of Peggys Cove. We went there to pay our respects. There were at least 30-40 people at the memorial when we got there. We could tell without a doubt, that some of these people had family or friends on the doomed flight. Their body language, expressions and them comforting of each other spoke loudly. Life is unpredictable. We stopped for lunch at a roadside Kiosk in West Dover called the Fisherman's Corner. Awesome lobster rolls and scrumptious fish and chips, don't miss it. "Mama" does the cooking. We went back mid afternoon to Tantallon to do some more email and blogging. Maia and Peter graciously hosted a dinner party that evening. We made some new friends, we were introduced to Anna-Lisa and René, two warm and wonderful people. Anna-Lisa is from Sweden and René is from Switzerland, just the opposite from Liz and myself. A most enjoyable evening with terrific company and gourmet food. For more pictures of this part of our trip click on the Picasa Web album below or go direct to the slide show here.